After you create a course in Studio, you can access information about it in the LMS by selecting Instructor to access the instructor dashboard. Select Instructor, and then select Course Info. The Basic Course Information section of the page that opens lists information about the course. The course data that displays on the instructor dashboard is defined in Studio, or derived from data that you define in Studio. Organization: Specified in Studio when you create the course. Becomes part of the course URL, and cannot be changed. Course Number: Specified in Studio when you create the course. Becomes part of the course URL, and cannot be changed. Course Name: Specified in Studio when you create the course. Becomes part of the course URL, and cannot be changed. In Studio, this field is labeled Course Run. 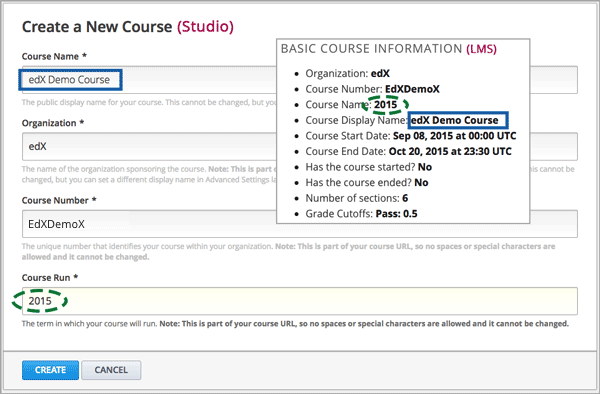 Course Display Name: Specified in Studio when you create the course. In Studio, this field is labeled Course Name. This name can be changed in Studio (not recommended if your course is live): From the Settings menu select Advanced Settings. The value for the Course Display Name policy key defines the course name that appears in the LMS only. The illustration that follows shows the information that you enter in Studio for a new course, side-by-side with the same information as it appears on the Course Info page of the instructor dashboard. Course Start Date: The date and time that the course is scheduled to start. This date can be changed in Studio (not recommended if your course is live). For more information, see Guidelines for Start and End Dates. Course End Date: The date and time that the course is scheduled to end. This date can be changed in Studio (not recommended if your course is live). For more information, see Guidelines for Start and End Dates. Has the course started: Derived from the Course Start Date value and the current date. 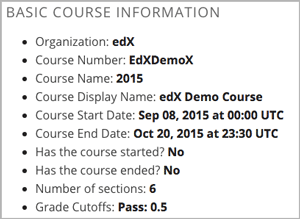 Has the course ended: Derived from the Course End Date value and the current date. Grade Cutoffs: Specified in Studio when you define the cutoff for a failing grade. Learners who earn exactly the cutoff value pass the course. Grading can be changed in Studio (not recommended if your course is live). For more information, see Set the Grade Range.